The Chief Ministers of two Punjabs — Capt Amarinder Singh and Ch Pervaiz Elahi — may be travelling together to North America from April 8 to 18 this year to participate in Baisakhi celebrations in all major towns, says Mr Vikramjit Singh Bajwa, a US-based NRI. The term of the subcommittee on education reforms in the state, “reconstituted” by the Punjab Government in August, last year, expired once again without holding any meeting. Kisan bodies have withdrawn their decision to send farmer’s jathas to Chathewala village from tomorrow to check January-20 auction of a peasant’s land following cancellation of the auction. Former Chief Minister and President, SAD Mr Parkash Singh Badal, while accusing both Centre and state Congress governments of destroying the agriculture in Punjab under a conspiracy, said his party would make this an election issue in Haryana Assembly elections and in Ajnala bypoll in Punjab. The SGPC chief, Bibi Jagir Kaur, has directed the secretary, Shiromani Committee, to scrutinise certificates and personal files of all employees so that action could be taken against those who had got employment on the basis of ‘bogus certificates’. After a wait of over eight months, Municipal Councillor Paramjeet Kaur was finally administered oath of office following the verdict of Punjab and Haryana High Court in her favour. 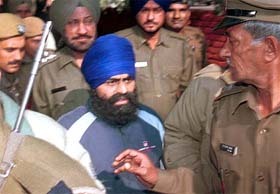 A dreaded Khalistan Liberation Force militant, Davinder Pal Singh Bhullar, who has been awarded death penalty by the Supreme Court in a case related to the attack on the former Indian Youth Congress chief, Mr MS Bitta, today alleged that his confession was forcibly recorded by the Delhi Police. The Midday Meal Scheme, which had lost steam midway, has been discontinued in some primary schools of the tehsil owing to the administration’s new proposal to provide fresh cooked food to these students. More than 10 teams of income tax sleuths today conducted surveys of about 10 premises, including a jewellery shop, two schools, a junk shop and a tent house, to find out whether they had evaded income tax or not. The Punjab Chief Minister, Capt Amarinder Singh, who is scheduled to visit Andaman and Nicobar Islands on January 20 and 21, will be having very difficult task to handle there. Sources said Sikh ex-servicemen and other Punjabis settled in and around Campbell Bay wanted to shift to Punjab. After more than a fortnight of unscheduled power cuts, the Punjab State Electricity Board has decided to schedule them even as power availability in the state is showing no signs of improvement in the near future. Hundreds of employees of the Punjab State Electricity Board under the leadership of Mr Harbans Singh, district convener of the PSEB Employees Joint Forum, today staged a protest dharna and held a rally near the office of the Deputy Commissioner here demanding the withdrawal of case registered against 12 PSEB employees by the Malerkotla police on the complaint of the Vigilance authorities on August 21,2004. Local shopkeepers and traders protested against the proposed implementation of VAT from April 1 next by putting up small black flags on their shops and wearing black badges here today. Preliminary investigations carried out by the Punjab Police have revealed that the allegations of atrocities levelled by three Dalits were "patently false". The trio had earlier claimed that they were forced to taste urine — and insult — from the slippers of upper caste members. More than 500 Dalits, led by Bahujan Samaj Party general secretary Pawan Tinu and vice-president M.P. Singh Goraya, held a demonstration and dharna at Ambedeker Chowk and blocked vehicular traffic in Nakodar in protest against indifferent attitude of the civil administration towards the Dalit community yesterday. The district administration today claimed to have curbed the stray cattle menace in the city while handing over a cheque for Rs 1 lakh to the chief of a gaushala at Bir Sikhawala village, Baba Malkit Singh. The controversial Nihang chief of Tarna Dal, Baba Ajit Singh Poohla, facing a number of murder, extortion, kidnapping and other cases, appeared with his armed supporters in a local court here today. The Union Government has proposed to sign Memorandum of Understanding with the state government’s on procurement of foodgrains. The Ministry of Food and Public Distribution and Consumer Affairs has sent a draft to the states in this regard. The pilgrims from Punjab going to the Mata Vaishno Devi shrine can now book accommodation in Katra town of Jammu and Kashmir at their doorsteps. A memorandum of understanding to this effect was signed here today between the authorities of the Punjab Tourism Development Corporation and the Mata Vaishno Devi Shrine Board. Under programme to provide on the spot facilities to the needy 105 plots were allotted among homeless people belonging to the Scheduled Castes and loans over Rs 20 lakh were distributed by banks among the applicants at the third “Suvidha” camp organised by the district administration at Kabirpur village today. The Chairman of the Zila Parishad, Ropar, Ms Kuldeep Kaur, yesterday suspended her accountant for issuing cheques worth Rs 24.50 lakh without her consent to the Minister of Animal husbandry and Fishery, Mr Jagmohan Singh Kang, to distribute the same among villages for development works . A case of murder came to light this afternoon in which a person was first murdered and then his body was set on fire in sugarcane field of nearby Khangura village. The police recovered a badly charred body and brought it for a post-mortem to the Civil Hospital, Phagwara. A team of the local Vigilance Bureau caught Subdivisional Engineer Satinder Singh and lineman Tota Ram of the PSEB, Subdivision Shamchaurasi, while accepting bribe of Rs 4,000 and Rs 1,000 from a farmer of Dhode Majara, respectively, today. About 15 armed thieves struck at a Food Corporation of India godown and fled with two truckloads of wheat after locking three guards on duty in a room here on Sunday night. A case under secitons 323, 341 and 506 has been registered at the Sadar police station here against a woman teacher, Ms Vijay Kumari, and her son Anurag on the charge of criminal intimidation of Rakesh Kumar,a ninth class student of Govt Senior Secondary School, Jagatpur Jattan. In another setback to Dr J.S. Dhillon, Principal, B.Ed Khalsa College, the legal opinion sought by Guru Nanak Dev University regarding depositing of his son’s fee, who had got admission in the B.Tech (Electronics) course under teacher’s quota, has gone against him. He may now have to deposit full fee for the admission of his ward. In a letter to the Chief Minister of Punjab, the students, who are willing to appear for the elementary teacher training entrance test, have urged the authorities concerned to carry out the revision of syllabus from which the examination paper would be set. In response to the call given by Punjab and Chandigarh College Teachers’ Union, teachers working in non-government colleges in Patiala, Ropar, Fatehgarh Sahib, Bhatinda, Sangrur, Mansa and Chandigarh staged a march barefooted from the Fountain Chowk to the Chief Minister’s residence here today. Members of the Guru Nanak Dev University Teachers Association today held a dharna in front of the office of the Vice-Chancellor for three hours to protest against the headship issue of Department of Sports Medicine and Physiotherapy.